After 60 years of dreaming of a close-up solar mission, it's quickly approaching time for NASA to realize that goal. Last week, the agency announced that the Solar Probe Plus mission has moved into "advanced development" ahead of a launch in 2018. It's being built by the Johns Hopkins University Applied Physics Laboratory (JHUAPL). Where does the sun's energy flow? How is the outer atmosphere heated? These are some of the main questions that NASA's Solar Probe Plus will answer. The microphone drop will happen when the probe gets the chance to fly through the solar corona, something scientists have wanted to do for 60 years but couldn't until the technology caught up. 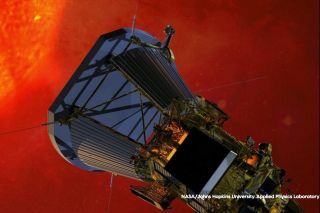 "Solar Probe Plus is a true mission of exploration; for example, the spacecraft will go close enough to the sun to watch the solar wind speed from subsonic to supersonic, and it will fly through the birthplace of the highest-energy solar particles," JHUAPL wrote on the mission website. "Still, as with any great mission of discovery, Solar Probe Plus is likely to generate more questions than it answers." It's very common for spacecraft to use gravity assists to reduce their fuel requirements (which saves on launch weight and therefore money). But the tradeoff for Solar Probe Plus will be time as it flies seven times by the planet Venus between 2018 and 2024. It's only after the seventh flyby that Solar Probe Plus will be close enough to the sun to do all of the science that researchers desire. That said, the spacecraft will not be idle during this time. You can bet it will be looking at the star from afar, and that when it flies by Venus at least some science instruments will be turned on to look at the planet. It's like a bonus Venus mission. Solar Probe Plus will need to withstand a lot of heat when it gets up close to the sun. Its closest approach is expected at 3.7 million miles (5.9 million kilometers), about seven times closer than Mercury ever gets to the sun. This also handily beats the record set by the Helios 2 spacecraft, which really just grazed the inside of Mercury's orbit. It passed about 27 million miles (44 million kilometers) from the sun in Apirl 1976. From both close up and afar, it will look at the solar wind (the stream of particles from the sun), energy transfer through the sun, and something called "dusty plasma" — superheated gas with suspended particles in it — near the sun. The sun has a lot of mysteries surrounding its magnetic field. The main one is why the sun reverses polarity every 11 years in a cycle which sees it go from a weakling with pracically no sunspots, to a monster spewing solar flares, and back to a weakling again before switching polarites once more. A big part of the Solar Probe Plus mission is to probe the magnetic field and other parts of the sun to make better predictions about when the next flare will head towards Earth. Big-enough solar flares can cause damage to satellites and even power lines. This image from the Solar Dynamics Observatory shows just how complicated the magnetic field is. "The complex overlay of lines can teach scientists about the ways the sun's magnetism changes in response to the constant movement on and inside the sun," NASA wrote in March. "Note how the magnetic fields are densest near the bright spots visible on the sun — which are magnetically strong active regions — and many of the field lines link one active region to another." If you're going to get close to the sun for long periods of time, you have to make sure your spacecraft can take the heat. Solar Probe Plus will carry a huge shield that is eight feet in diameter and 4.5 inches thick, made up of carbon-carbon carbon foam. Its solar arrays, JHUAPL said, will move around to make sure that the panels maintain the proper heat and power, retracting and extending as required. Some "heat-resistant technologies," JHUAPL added, came from NASA's MESSENGER spacecraft, a Mercury probe that flew by the planet three times before settling into an orbital mission that ran between 2011 and 2015. For example, the solar shield on Solar Probe Plus is similar to designs of MESSENGER's sunshade.